Pine Line is a great way to warm up for a day of cragging at the base of El Cap. In addition to being a starting variation of The Nose, Pine Line is a fun thin crack climb. 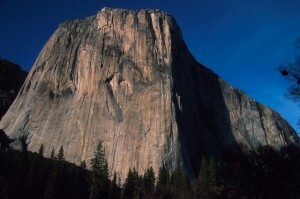 The route begins on a terrific ledge with El Cap rising high above. The line follows a polished thin crack (offering good protection) that leads to another good ledge. The route is easily rappelled with one rope. Be aware while climbing anywhere along the base of El Cap that there is a danger of rocks and/or gear being dropped from above and falling within a few yards of the wall! Which SuperTopo guidebooks include a topo for Pine Line? The base routes are scattered to the left of the SE Buttress.